Helmet cam footage from an accident posted on the "Hia" site on Facebook showed a big biker slam into the back of a pick-up. The black pick up had itself been bit by a "tow truck" pick up going the wrong way. The driver of the purple vehicle said he was going to the scene of an accident and has his siren on. He appeared to be blaming a truck. It was not a foundation vehicle but a breakdown vehicle of some kind. 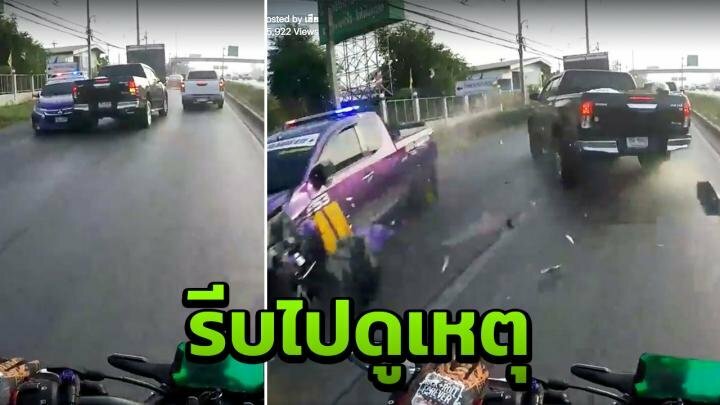 There was much debate online about what actually happened and Thai Rath admitted they had yet to get to the bottom of this latest madness on the Thai roads. Hope the biker is ok ? didn't even have enough time to apply the front brake. Tow truck 100% to blame, whether he had a siren on, lights flashing, he had no right going against the traffic. Indeed 100% blame on the tow truck, absolutely no reason for them to go against traffic. These clowns think they can do as they please. Completely mad and seemingly quite fast, not expecting that others might be caught by surprise. In his other life he does that on the scooter. You're mistaken Colin, he's Thai he has EVERY right, don't worry it's an easy mistake to make. Bike camera saw the black truck brake lights on - did he slow down ? Truck was in a different lane (why would he slow?) and it was one second from the pickup being hit and him getting collected. I don’t believe any rider could have avoided the same outcome. he was in a different lane, do you slow down when you are in the right lane and anyone in the left slows? words fail me. Sometimes Thai drivers just make me want to vomit, they are so 'xxxxxxx' stupid. What do you mean "sometimes"
Another one for Youtube bloopers. That's entertainment.